Get here NCERT Solutions for Class 12 Business Studies Chapter 7. These NCERT Solutions for Class 12 of Business Studies subject includes detailed answers of all the questions in Chapter 7 – Directing provided in NCERT Book which is prescribed for class 12 in schools. Class 12th Business Studies Chapter 7 – Directing NCERT Solution is given below. Question 1. Which one of the following is not an element of direction? 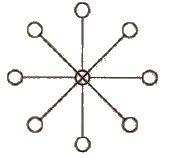 Answer (c) Delegation is not en element of direction. Answer (c) Abraham Maslow gave the hierarchy of five human needs. Question 3. Which of the following is a financial incentive? Answer (b) Stock incentive is a financial incentive which is a employee stock option with a tax benefit. Question 4. Which of the following is not an element of communication process? Answer (b) Communication is not the element of communication process, it is understood as a process of exchange. Answer (d) Informal system of communication is referred as “Grapevine” . Answer (b) Status related to organisation, Thus, it is a organisational barrier. Answer (b) Narayana Murthy promoted Infosys. Answer (c) Self actualisation need is the highest level of need as it refers to the drive to become what one is capable of becoming. Answer (b) The process of converting message into symbol is known as Encoding. Answer (c) In the wheel network, the communication takes place in such a manner that subordinates under a supervisor communicate through supervisor only. Question 1. Distinguish between leaders and managers. Answer Motivation is defined as inducing, inspiring and stimulating a person to perform with their best ability, to accomplish the goal. It depends upon satisfying needs of people. In the words of Farland, “motivation is the way in which urges, desires, aspirations or needs, direct control and explain the behaviour of human beings”. Question 3. What is informal communication? Answer The social interactions, gossips, friendly talks and non officiat matters which are discussed among different members of organisation who are not officially recognised is known as informal communication or we can say the communication that takes place without following the formal guidelines of communication Is said to be informal communication. This type of communication establishes the personal relationship among employees. It is flexible, dynamic and no records of information communication are maintained under this Informal communication system is generally referred to as “Grapevine”. Question 4. What are semantic barriers of communication? Question 5. Who is a supervisor? Answer Supervision means instructing, guiding, monitoring motivating and observing the activities of employees from over and above. The person who is performing the work of supervision is known as supervisor. Supervisor is the link between management and subordinates. He is the person who translates the policies and plan of management to the subordinates and revert back the complaint, suggestions and feedback of subordinates to management. Question 6. What are the elements of directing? (i) Supervision It can be understood as the process of guiding and instructing the efforts of employees. (iii) leadership It is the process of mtluencmq the behaviour of people by making them strive voluntarily towards achievement of organisational goals. (iv) Communication It is the process of exchange of ideas, Views, facts, feelings etc between or among people to create common understanding. Question 7. Explain the process of motivation. 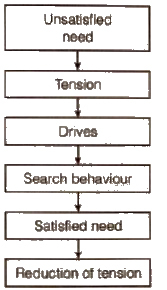 Answer Motivation process is based on how unsatisfied human need gets satisfied and results in reduction of tension. (i) Unsatisfied Need The need of an individual which is not satisfied. (iii) Drive This tension creates drive and an Individual starts looking for alternatives to satisfy the need. (iv) Search Behaviour Then he starts behaving as per chosen option. (v) Satisfied Need After opting the chosen behaviour his need got satisfied. (vi) Reduction of Tension The fulfillment of need results in relieving of tension. Question 8. Explain different networks of grapevine communications. (i) Single Strand Network Each person communicates to the other in sequence. (ii) Gossip Network Each person communicates with all on non-selective basis. Question 1. Explain the principles of Directing. (i) Maximum Individual Contribution This principle emphasises that directing techniques must help every employee to contribute to his maximum potential in order to achieve the organisational goals. It should help In bringing out unused or dormant potential of an employee to improve the efficiency of the organisation. e.g., suitable and appropriate Incentives should be given to encourage employees to improve their performance. (ii) Unity of Command This principle insists that a person in the organisation should receive Instructions from one superior only. If Instructions are received from more than one, it creates confusion, conflict and disorder In the organisation Adherence to this principle ensures effective direction. (iv) Appropriateness of Direction Technique According to this principle. appropriate motivational and leadership technique should be used while directing the people based on subordinate needs capabilities. attitudes etc, e.g .. combination of both monetary and non-monetary Incentives should be used to elicit the right response from the employees. (v) Managerial Communication Directing should convey clear Instructions to create total understanding to subordinates Through proper feed back the manager should ensure that subordinate understands his instructions clearly. (vii) Leadership While directing the subordinates managers should exercise good leadership as it can influence the subordinates positively without causing dissatisfaction among them. (viii) Follow Through Mere giving of an order is not sufficient Managers should follow It up by reviewing continuously whether orders are being implemented accordingly or any problems are being faced by the subordinates. Question 2. Explain the qualities of a good leader. Do the qualities alone ensure leadership success? (i) Physical Features It IS believed that good physical features attract people. Height. weight. health. appearance determine the physical personality of an individual. (iii) Integrity He should be a role model to other regarding the ethics and values A leader should possess high level of integrity and honesty. (iv) Initiative A good leader never waits for opportunities to come to his way rather he grabs the opportunity and use it to the advantage of organisation. (v) Communication and Motivation Skills A leader should be a good communicator. He should have the capacity to explain his Ideas and make the people to understand his Ideas. He should also understand the needs of people and motivate them through satisfying their needs. (vii) Decisiveness Leader should be able to take decisions while managing the work. Once he is convinced about a fact, he should be firm and should not change opinions frequently. (viii) Social Skills A leader should be sociable and friendly with his colleagues and followers. He should understand people and maintain good human relations WIth them. Many times, the success of an organisation is attributed to the leader, but due credit is not given to the followers. Many followers related factors like their skills, knowledge. commitment, willingness to co-operate team spirit etc make a person an effective leader It is said that followers make a person, a good leader by acceptance of leadership. Therefore both followers and leaders are playing an vital role in leadership process. Question 3. Discuss Maslow’s Need Hierarchy theory of motivation. 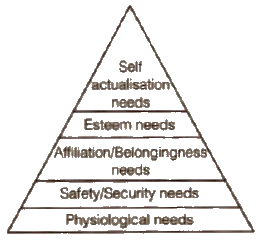 (i) Basic Physiological Needs These needs are most basic in the hierarchy and corresponds to primary needs. Food, clothing shelter are a few examples of this type of need Basic salary helps to fulfill these needs. (iii) Affiliation/Belonging Need These needs refer to human feeling of belongingness. We all as human beings look forward to being accepted In the society e.g.. friendship. (v) Self-actualisation Needs It is the highest level of need in the hierarchy It refers to the drive to become what one is capable of becoming The needs include growth self-fulfillment and achievement of goals etc. Question 4. What are the common barriers to effective communication suggest measures to overcome them? Answer Common Barriers to Effective Communication Managers in all organisations face problems due to communication barriers These barriers may prevent a communication or filter part of it or carry Incorrect meaning due to which misunderstanding may be created. Therefore all managers should take some steps to overcome these barriers. (a) Badly Expressed Message Sometimes the message is not communicated correctly by the manager because of inadequate vocabulary, usage of wrong words. omission of needed words etc. (b) Symbols with Different Meaning A word may have several meanings Receiver has to perceive one such meaning for the word used by communicator. (c) Faulty Translations Sometimes while translating If incorrect translation is done due to poor command over both the languages then meaning of the message changes This leads to cause different meanings to the communications. (d) Unclarified Assumptions Sometimes communication may have certain assumptions which are subject to different interpretations the one should always clear the meaning of what he is instructing the worker to do, so that the worker has no doubts in his mind. (e) Technical Jargon Sometimes specialists may use technical words in their communication by which the receiver IS not aware Therefore, they may not understand the complete conversation. (f) Body Language and Gesture Decoding The body movement and body gestures plays an important role in conveying the message. If there is no match between what is said and what is expressed In body movements, communications may be wrongly perceived. (a) Premature Evaluation Sometimes people evaluate the meaning of message before the sender completes his message. Such premature evaluation may be due to preconceived notions. (b) Lack of Attention If the mind is pre-occupied then the result is non-listening of message by receiver act as a major psychological barrier. (c) Lon by Transmission and Poor Retention When message passes through various levels. successive transmission of message results in loss of information. It happens mostly with oral communication. Also people cannot retain the information for a long time if they are inattentive or not interested. (d) Distrust If the communicator and communicate do not believe on each other. they can not understand each others message in its original sense as they are not giving importance to the information exchanged. (a) Organisational Policy If the organisational policy is not supportive to free flow of communication, it may hamper effectiveness of communications. (b) Rules and Regulations Rigid rules and cumbersome procedures may be a hurdle to communication similarly, communication through prescribed channel may result in delays. (c) Status Status of superior may create psychological distance between him and his subordinates The people working at higher level may not allow his subordinates to express their feelings freely. (a) Fear of Challenge to Authority If a supenor feels that a particular communication may effect his authority negatively then he/she may not speak it out clearly and openly. (b) Lack of Confidence of Superior on his Subordinate If superiors do not have confidence on their subordinates, they may not seek their advice or opinions. (c) Unwillingness to Communicate Sometime subord nator may not be prepared to communicate with their superiors if they think that it may adversely affect their interests. (i) Clarify the Ideas Before Communication The entire message to be communicated should be studied in depth analysed and stated in such a manner that It is clearly conveyed to subordinates. The message should be encoded In simple language which is understandable. (iii) Consult Others Before Communicating Before communicating anything. others who are linked with it In some way or the other should be taken Into confidence for developing a better pian. (v) Convey Things of Help and Value to Listener It is always better to know the interests of the people with whom you are communicating. If the message relates directly or Indirectly to such interests and needs II certainly evokes response trom communicate. (vii) Follow up Communication There should be a regular follow up and review on the instructions given to subordinates Such follow up measures help in removing hurdles If any In implementing the instructions. Question 5. Explain different financial and non-financial incentives used to motivate employees of a company. (i) Pay and Allowances For every employee, salary is the basic monetary incentive It Includes basic pay, DA and other allowances Salary system consists of regular increments In the pay every year and enhancement of allowances from time to time. (ii) Productivity Linked Wage Incentives Several wage incentives aim at linking payment of wages to increase in productivity at Individual or group level. (v) Co-Partnership/Stock Option Under these Incentives schemes, employees are offered company shares at a set price which is lower than market price The allotment of shares creates a peeling of ownership to the employees and makes them to contribute more for the growth of the organisation. (vi) Retirement Benefits Several retirement benefits such as provident fund, pension and gratuity provide financial security to employees after their retirement. This act as an Incentive when they are In serv-es in the organisation. (i) Status Status means ranking or high positions In the organisation. Whatever power position prestige an employee enjoys in the organisation are indicated by his status Psychological, social and esteem needs of an Individual are satisfied by status given to their job. (vi) Job Security Employees want their job to be secure. They want certain stab lily about future income and work so that they do not feet warned on these aspects and work with greater zeal There is only one problem with this Incentive i.e., when people feel that they are not likely to lose their jobs. they may become relaxed. (vii) Employee Participation It means Involving employees In decision making of the Issues related to them. In many companies, these programmes are In practice In the form of joint management committees. work committees canteen committees etc. Question 1. The workers always try to show their inability when any new work is given to them. They are always unwilling to take up any kind of work. Due to sudden rise in demand a firm wants to meet excess orders. The supervisor is finding it difficult to cope up with the situation. Suggest ways for the supervisor to handle the problem. Answer “he superv sor can take help of monetary incentives to motivate the workers Their wages can be linked to productivity they can earn more incentives besides wages by producing goods. Supervisor should also play the role of a good leader and encourage them to accept any kind of work as It would lead to Increase exposure to tre industry and better job prospects. Question 2. Workers of a factory often come to the production manager with the grievances. The production manager finds himself overburdened with so many tasks advise a way to relieve the production managers. (iii) Recommend the cases of the workers for promotion, rewards. transfer, punishment etc. (v) Delegate sum of rus authorities. Question 3. In an organisation employees always feel they are under stress. They take last initiative and fear to express their problems before the manager. What do you think is wrong with the manager? Answer The manager should adopt more friendly approach towards the workers. The manager should encourage a system of two-way communication, provide an outlet to workers to share their feelings, suggestions and problems. Question 4. In an organisation all the employees take things easy and are free to approach anyone for minor queries and problems. This has resulted in everyone taking to each other and thus resulting in inefficiency in the office. It has also resulted in loss of secrecy and confidential information being leaked out. What system do you think the manager should adopt to improve communication? Answer Excess of everything is bad. More use of Informal communication IS resulting in this problem. A proper chain of command should be established. Only the necessary information should be passed through chain of command The employees will not be allowed to communicate at all levels. This Will save time and more discipline. Y limited is a bank functioning in India. It is planning to diversify into increase business. Lately, the Government of India has allowed the private sector to gain entry in the increase business. Previously, it was the prerogative of LIC and GICto do insurance business. But now with liberalisation of the economy and to make the field competitive other compnies have been given licenses to start insurance business under the regualtion of 1nsurance Regulatory and Development Authority’. Y limited plans to recruit high quality employees and agents and exercise effective direction to capture a substantial part of life and non-life insurance business. Question 1. Identify how the company can supervise its employees and agents effectively. What benefits will the company derive from effective supervision? (ii) Make them understand the various policies so that they can convince their clients. (iii) Establishing targets for them and also monetary incentives. (iv) Regularised system for submission of periodical reports of their performance. (ii) Knowledge of the products of the Insurance company will ensure better satisfaction tor the clients. (iii) They will compete to give better performance and earn higher incentives. (iv) It will help in identifying the areas where workers and agents need specialised training programmes. Question 2. What financial and non financial incentives can the company use for employees and agents separately to motivate them. What benefits company will get from them? (d) Recognition programmes like certificate of merit etc. (e) Company achieves the motivation among the employees and they will contribute more in achieving targets. Question 3. How can the company ensure that higher order needs i.e., the esteem and self actualisation needs are met? Question 4. Identify the qualities of leadership in this line of business that the company manager must possess to motivate employees and agents. Question 5. Give a model of formal communication system that the company can follow. Identify the barriers in this model, how can they be removed? (i) Barriers Due to Organisational Structure An organisational structure is complex with numerous levels in between which creates distance between the top management and the workers. With long lines of communication, there is possibility of message losing its significance. (ii) Psychological Barriers Everyone perceives information in the light of their own experiences, prejudices and thinking. (iii) Inability to Communicate The lack of ability to communicate leads to misunderstanding and confusion. Different people have different meaning for same words. (iv) Status and Position Sometimes, effective flow of communication is hampered by status and position of the sender and receiver. (i) Clarity in the thoughts of the sender is must for effective communication. (ii) The sender should try to make the message meaningful and understandable. (iii) Message should be precise and to the point. (iv) The sender should always take the feedback from the receiver. Question 6. How can informal communication help to supplement formal communication model given by you in answer to question? (i) It helps the members to discuss the matters which cannot be discussed at the official level. (ii) It is a way of knowing the reactions and opinions of the people about a change. (iv) The information flows at a faster speed.